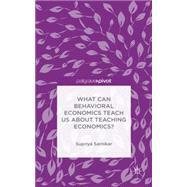 Sarnikar cites evidence of frequent misconceptions of economics amongst students, graduates, and even some economists, and argues that behavioral economists are uniquely qualified to investigate causes of poor learning in economics. She conducts a review of the economics education literature to identify gaps in current research efforts and suggests a two-pronged approach to fill the gaps: an engineering approach to the adoption of innovative teaching methods and a new research program to enhance economists' understanding of how learning occurs. To facilitate research into learning processes, Sarnikar provides an overview of selected learning theories from psychology, as well as new data on hidden misconceptions amongst beginning students of economics. She argues that if they ask the right questions, economists of all persuasions are likely to find surprising lessons in the answers of beginning students of economics. Supriya Sarnikar received her Ph.D. in economics from University of Arizona and a J.D., from George Mason University School of Law. She has more than 8 years of experience in teaching economics, has completed all three phases of the Teaching Innovations Program of the American Economic Association, and is a regular speaker at regional and local conferences on pedagogical issues. She has received a Course of Distinction award from Massachusetts Colleges Online for her online course in principles of microeconomics.